Good morning and happy Monday! Hope you all had a fantastic weekend. Are you ready for a brand new challenge at Lollipop Crafts? This week we want you to use ALL WHITE with a SPLASH of color! and we have a new sponsor this week... The Greeting Farm!! This is one of their adorable digi set, Wonderland, that has five images to play with! I picked to work the RED as my splash of color, great for the mushrooms and the heart of Alice's dress. Added some very light shadow colors on the images too. There are a few layers too, but forgot to take a picture to show that - maybe if you click on the image to enlarge, you can see a little bit of it. 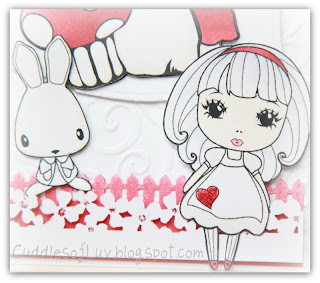 Okay... now get on the LC blog to see more gorgeous cards from the team, and link up to play for your chance to win a fabulous prize from our sponsor! Adorable image... You did a amazing card, love it! Beautiful! You did an awesome job with this one. Soooo cute Mimi. The splash of red is very eye-catching. This is absolutely FANTASTIK! Girl you rocked this one out and using the Wonderland collection was unexpected and cool. The touches of red brilliant! I need that flower border punch! Great card! Love the scene with the splash of red! 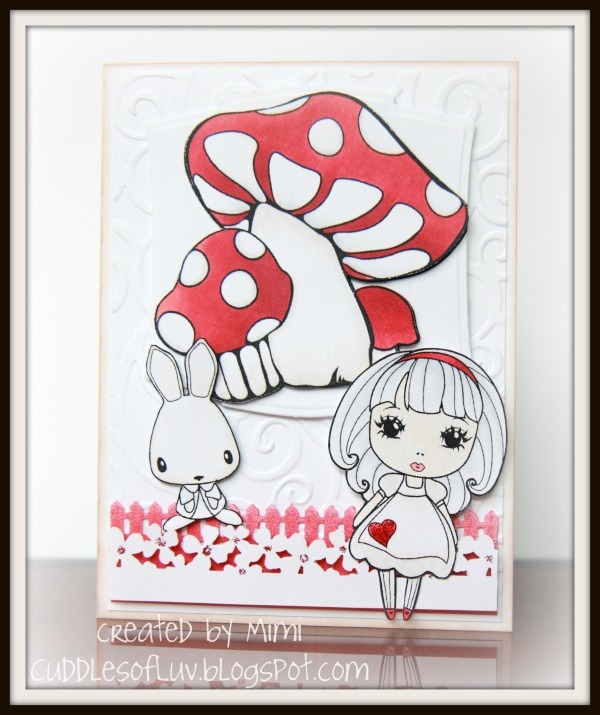 Such a cool challenge and your card is so striking Mimi, totally awesome! what a great idea. never tried this before, but it looks like fun. hope all is well. have a wonderful week! 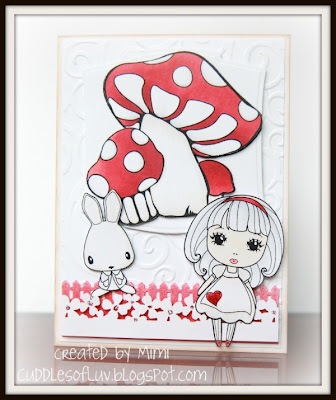 Mimi, this is such a pretty card and she is a cutie! You've colored the mushroom beautifully! Morning sweetie this is stunningly gorgeous..